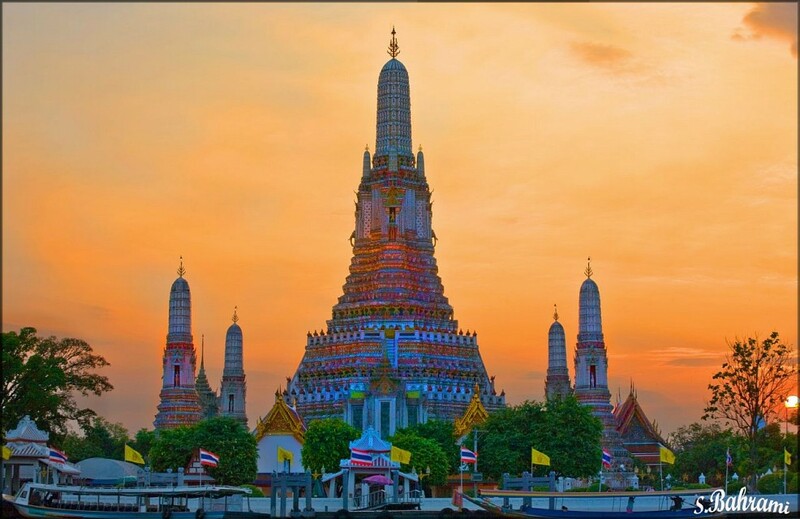 Wat Arun, or the ‘Temple of Dawn’, is probably the most well-known and photographed single edifice in Bangkok and stands utterly resplendent on the western, less visited, bank of the river. 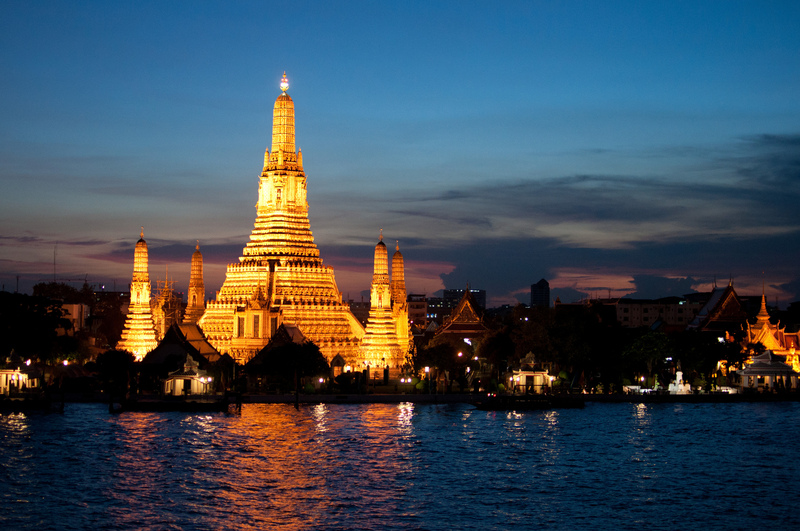 In the shape of a pyramid-like spire, the temple is easily recognizable from a distance and is a magnificent sight both at dusk (and not dawn as its name suggests) and at night, when it is superbly lit from below. The interior of the temple itself cannot be visit, yet for merely ฿50 ($1.55) you are welcome to peruse the gorgeous courtyard (full of souvenir stalls, fortune tellers and a lovely monk monastery), visit several of the halls within the estate and climb to the top of the highest tower. According to local legend, King Rama I and King Taksin, who had been childhood friends and fellow pages under the same king, had encountered a Chinese fortune teller one day, who foretold that they will both be kings, something which came true despite the unlikely odds. Taksin became a very good military leader and subsequently king during the Burmese war, and was succeeded by his general, Rama I. 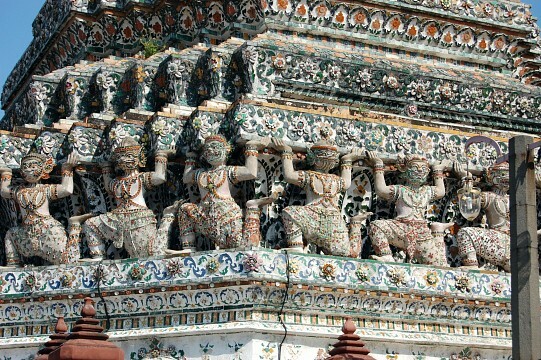 The temple of Wat Arun has existed since at least the 17th century, although under various other aliases. In the aftermath of the Burmese retreat in the battle of 1767, King Saphan Taksin and his fleet stumbled upon the temple right at dawn. The king was so impressed by the gleaming sunrise light it reflected that he restored it and gave it the name ‘Temple of Dawn’. 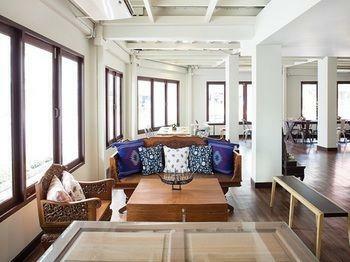 He also moved the capital from Ayutthaya to Chao Phraya's western bank, and built his palace around the temple. 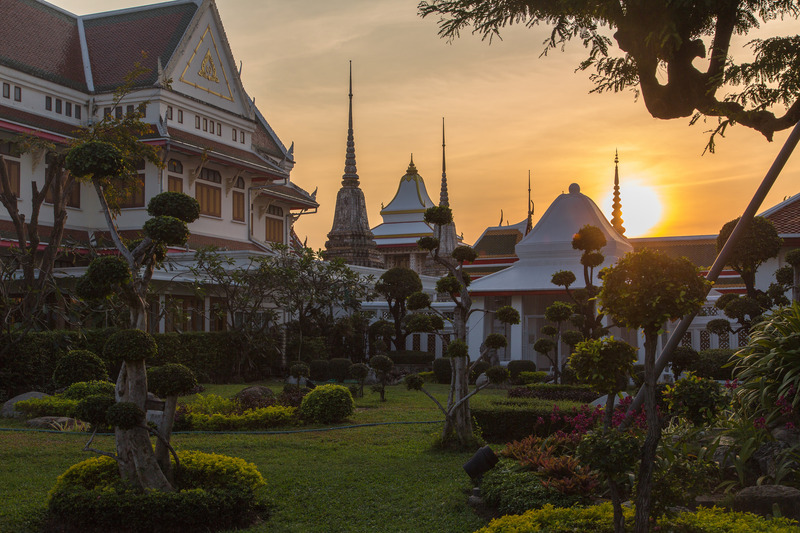 During Taksin's rule this temple was actually located within the ground of the Grand Palace which goes a long way in explaining why so much importance had been given to its restoration. The revered the Emerald Buddha was housed here until 1785, which is when Wat Arun8 was moved to the western side of the river bank, and the Emeral Buddha placed inside Wat Phra Kaew. 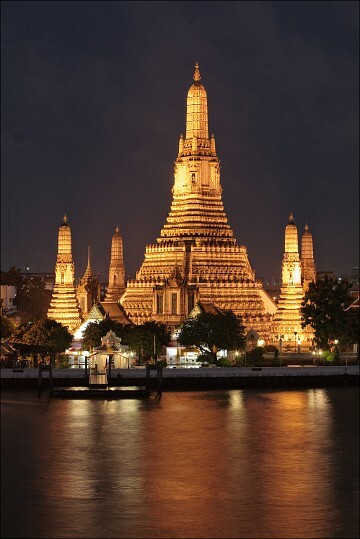 Wat Arun is the final resting place of King Rama II*. Even though the interior is not open to the public, the stunning and unique architecture of this temple still make it a must-see when in Bangkok, and by this we don't mean a quick glance from the eastern bank of the river, but a bona fide, lengthy visit. The most outstanding feature of the temple is its 86 metre tall Khmer-style spire, which is decorated with thousands of colourful and splendid shard of Chinese lacquered pottery and glass, something which you'll fail to see at a distance. The habit of collecting discarded pottery from passing Chinese trading boats, and recycling it to decorate the temples, was very popular during the period of the Rattanakosin Kingdom . The tall spire represents the centre of the universe, one which you are free to climb. The stair case can be physically demanding for some, but the visual rewards from the top are simply breathtaking. The three levels signify the the three planes of Buddhist existence: Traiphum (the realm of physical existence), Tavatimsa (that of desires) and Devaphum (that of heaven and happiness). 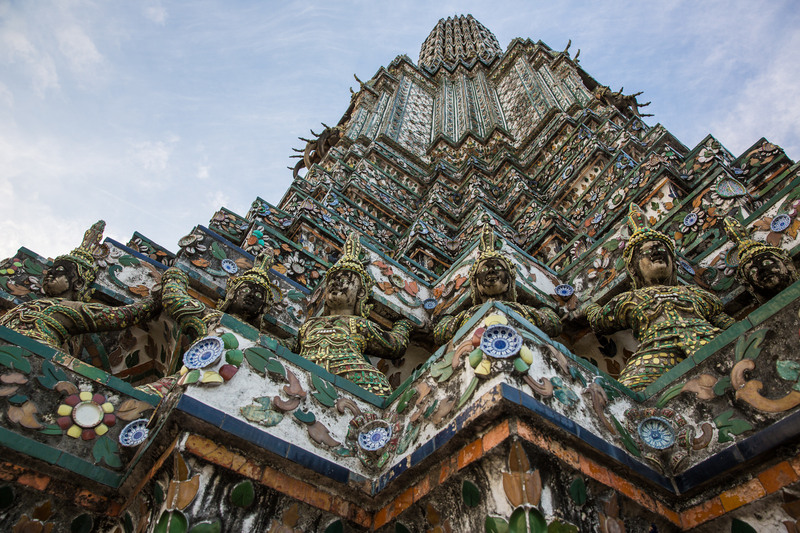 As you ascend to the top , you'll come across several sculptures depicting Erawan the three-headed elephant mount of Indra , the God of War, as well as Phra Phai, the God of Wind. the spires theselves feature rows of mythological creatures including demonic looking yaks and rather none-too-pleased monkeys. At the very top level, you'll get stunning riverside views and this will be your one chance to get yet another bird's eye view at the Grand Palace across the river. 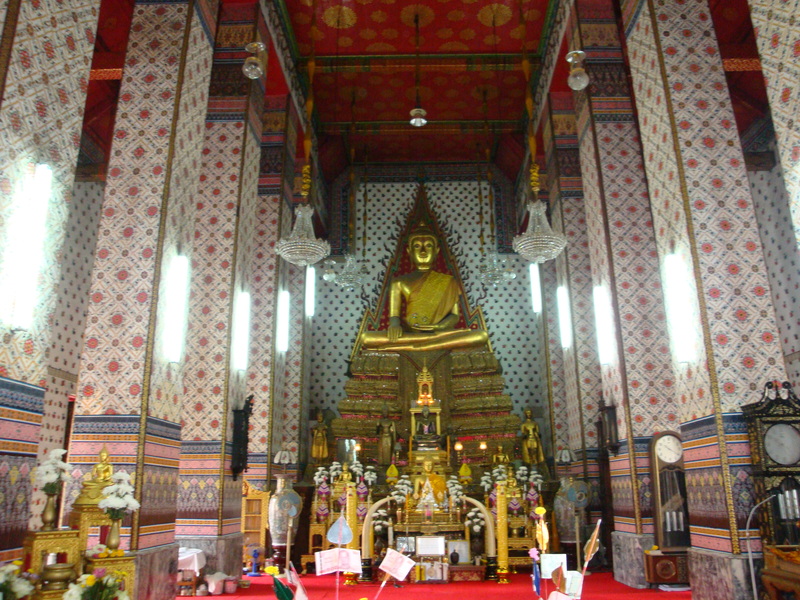 The Buddha statue housed within the Ordination Hall is said to have been crafted by King Rama II himself, who played a central role in the temple's restoration. The murals painted along eth walls are likewise colourful and striking, and said to have been requested by King Rama III murals painted. If you've always dreamt of dressing up in authentic Thai clothing and have your photo taken at an exorbitant price, then you can do that here. You may also choose to be blessed by a monk for a nominal fee yet although this used to be in the form of flowers, incense and food, dollar notes seem to be much more appropriate nowadays. Wat Arun is located on the western bank of the Chao Phraya, in the Rattanakosin district. To get there, the fastest and cheapest way is to take the SkyTrain to the Saphan Taksin station, which is located right on the bank of Chao Phraya, near the boat pier. The boats come frequently, and regardless of the boat you take (their destination differs according to the flag color), all of them pass by the Maharaj Pier (Wat Arun) or its opposite - Chang Pier (Grand Palace). You can also go there by taxi - they are quite cheap, though not as cheap as the boat ride but the traffic nuisance, long distances, and the fact that you don't know Bangkok very well, might turn into an unpleasant ride. The buses that go near the Tha Tien Pier (near Wat Pho) are 1, 25, 44, 47, 62, and 91, and stop on Maharat road. The temple is open daily from 8:30 AM to 5:30 PM. However, if you want to see something special, try visiting the temple during the Royal Kathin, one of the most vivid festivals in Thailand. 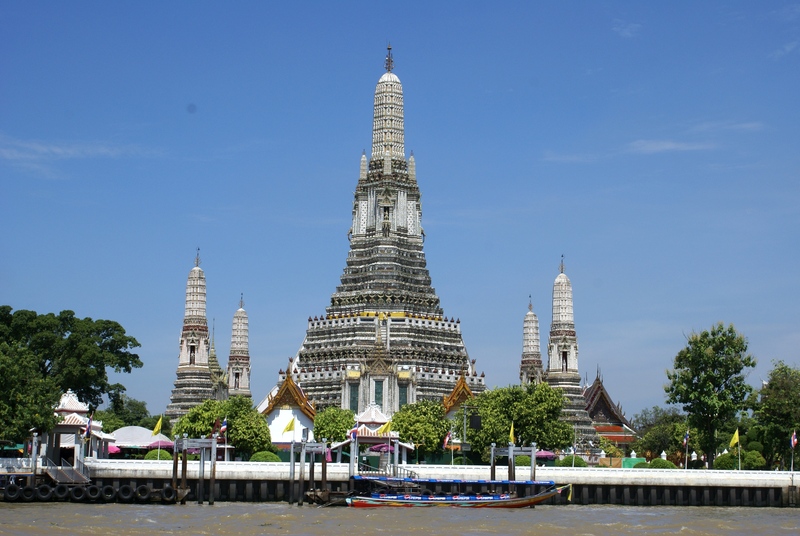 This is when the King travels to Wat Arun followed by a great procession of boats, to present the monks with new robes after the traditional period of lent. 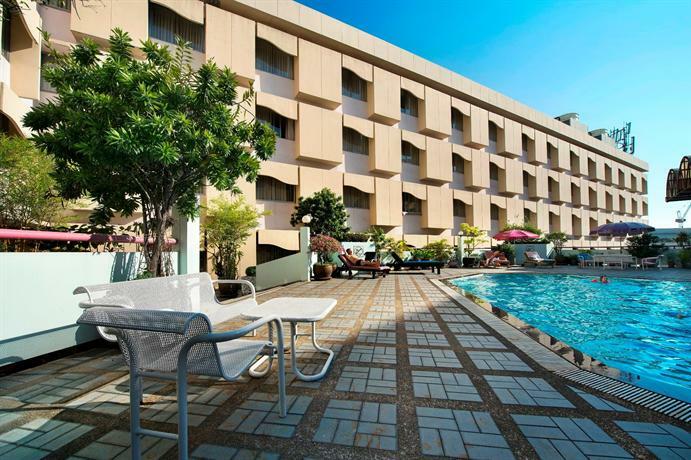 Clustered together with the Grand Palace and Wat Pho, and at a walking distance from Khao San Road, it is possible and quite convenient to visit all of them together. If you get off at Chang Pier, you can visit Wat Pho and the Grand Palace first. 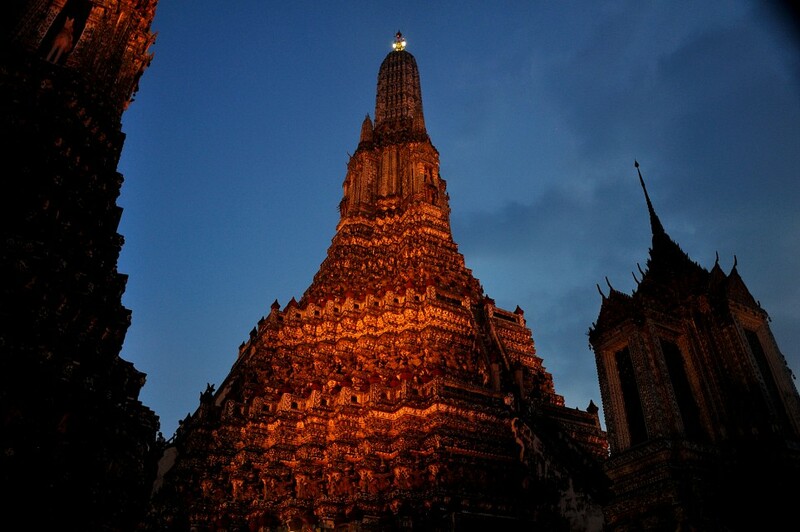 If you get off at Maharaj Pier, visit Wat Arun first, then cross over. One ride across is ฿5 ($0.16).